Latest news | Chord Explorer & Arpeggio Designer midi composition tools for Ableton Live now available. 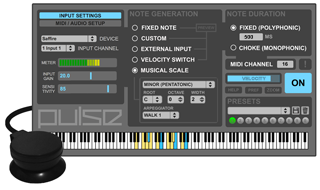 Latest news | Uzi Note Repeater for Ableton Live now available. Latest news | Pulse Controller is now offered with a clip sensor or a suction cup sensor. Latest news | Pulse Controller receives "Music Tech Excellence" award from Music Tech Magazine! See excerpts from the review here. The Pulse Controller is a hardware / software solution that liberates computer-based musicians and performers from conventional input devices by allowing surfaces - desks, laptops, objects and more - to become playable MIDI controllers. An included piezo sensor coupled with a powerful software mapping interface converts acoustic impulses into MIDI Note messages for playing your software instruments in an intuitive, responsive and connected manner. What does the Pulse Surface Controller System include? The system includes a hardware piezo sensor and a standalone software application that converts acoustic impulses from the sensor to MIDI information. What is the difference between the Suction Cup Edition and Clip Edition? Suction Cup Edition includes a suction cup piezo sensor that works well for smooth surfaces like plastic, glass and objects. The cable length is 9ft (3m) and can be extended via standard audio extension cables if needed. Also included with the Suction Cup Edition are velcro strips and reusable temporary adhesive circles for other installation types. The Clip Edition includes a clip piezo sensor that is perfect for attaching to desks and tables up to 1 5/16" (33.3mm) thick. The cable if 3ft (1m) and can be extended via standard audio extension cables if needed. Both editions include the Pulse Controller mapping software. How do I connect the Pulse Controller to my computer? The Pulse Controller sensor can be connected to an 1/8" computer audio input with the included adapter. Mac users can also connect the sensor through an external audio interface. Do I need any special drivers? The Mac version works with your computer or audio interface's audio driver. The Windows version requires the use of the ASIO4ALL low-latency audio driver and the LoopBe Internal MIDI driver for communicating with other MIDI applications on your computer. Both drivers are free and installation links are provided on the included disc. What operating systems are compatible with the Pulse Controller? The Pulse Controller is currently compatible with Intel Mac (10.5 or higher) and Windows (XP or higher). Do I need any other software to play sounds? Yes, you will need to have a MIDI-compatible sound application installed on your computer. What applications can I use with the Pulse Controller? The Pulse Controller can control any software application that supports the MIDI protocol. This includes Ableton Live, Cubase, Logic, GarageBand, Reason, Pro Tools, Nuendo, VST/AU plug-ins, and others. Can I use the Pulse Controller with other applications as well (for example VJ applications)? Yes, you can use it with any application that supports MIDI. Can I use the Pulse Controller with hardware devices like drum machines and synths? Yes, the Pulse Controller can trigger hardware devices as long as they are connected to your computer via a MIDI output from an external audio / MIDI interface. Does the system include sounds? The Pulse Controller does not include any sounds in its software. The Pulse Controller communicates with third-party applications that support MIDI, which is where the sounds are triggered. How does the Pulse Controller allow you to play melodies? The Pulse Controller features a melodic generator that will output notes, based on Scale settings, when you strike the surface. 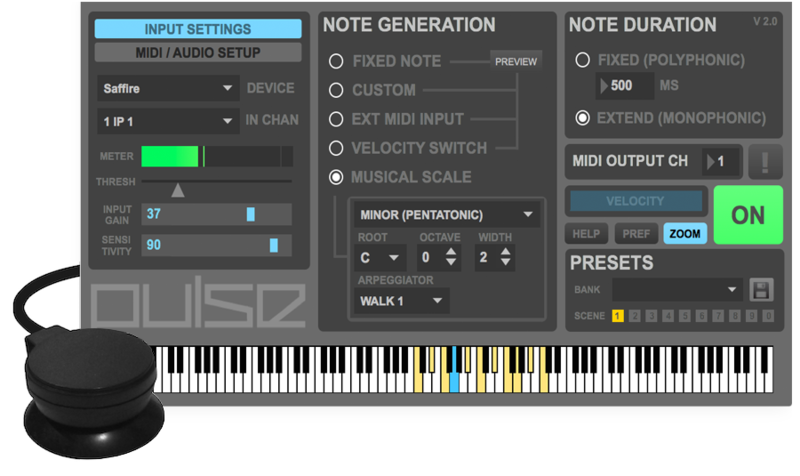 How does the Pulse Controller software trigger notes in multi-note sets and scales? The software features an arpeggiator that specifies how notes are triggered. The arpeggiator can be trigger notes randomly, in zig-zag 'walks', or in up / down steps. Does the Pulse Controller have a looping feature? The Pulse Controller does not have a looping feature at the present time. However, looping / overdub recording is possible in most software DAWs. Can I use multiple sensors with the Pulse Controller software? Pulse Controller does not currently support the use of multiple sensors. Can I use the sensor as a conventional microphone to record sounds? The sensor is primarily intended to be used as an input for the Pulse Controller software but can also be used as a contact microphone to record sounds. Is the Pulse Controller software a plug-in? The Pulse Controller software is a standalone application. This allows it to communicate with any other MIDI application, and multiple applications simultaneously. Is there a Max For Live version of the Pulse Controller software? A Max For Live version is not currently available. Is the Pulse Controller velocity-sensitive? Yes, the Pulse Controller senses how hard you strike the surface. Does the Pulse Controller sense where you are hitting the surface? The Pulse Controller does not currently sense where you are hitting the surface, it only senses velocity. Can I create my own custom mappings? Yes, the software allows you to place your own note sets on the virtual keyboard. These note sets, as well as other performance mappings, can be stored and recalled as presets. Does the software support keyboard shortcuts? Yes, you can use keyboard shortcuts to quickly access important performance settings and presets without having to reach for the mouse. I live outside the USA, do you ship internationally? Yes, please visit the PURCHASE page for ordering information.